The HP SlateBook x2 comes with a well designed keyboard dock and offers decent performance, but that's about where the good things end. There are too many significant flaws to recommend, including a lacklustre display, a proprietary charger with an unnecessary, oversized power brick, and poor battery life. It's also significantly overpriced. 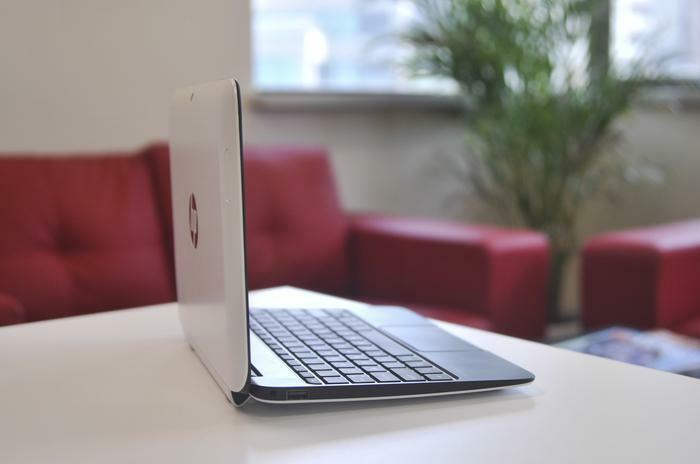 ASUS' Transformer range of tablets have virtually been uncontested in the dockable Android tablet space, but HP's new SlateBook x2 aims to change that. 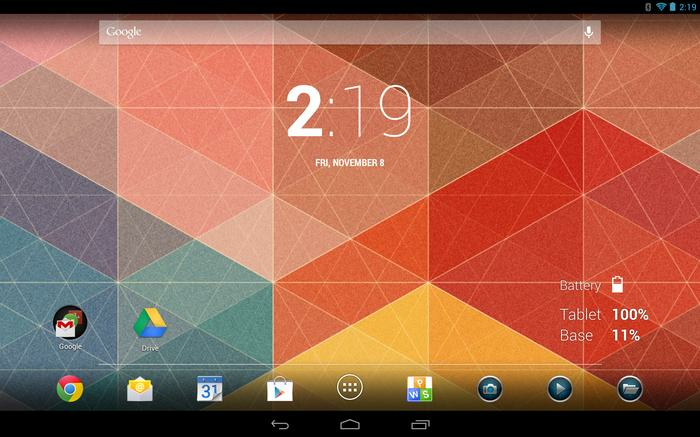 It's an Android tablet that comes with a detachable keyboard dock that houses an extra battery. Although the keyboard dock is well designed and the tablet offers decent performance, the SlateBook x2 has too many significant flaws to recommend, including a lacklustre display, a proprietary charger with an unnecessary, oversized power brick, and poor battery life. The SlateBook x2 simply looks and feels like a Windows netbook. 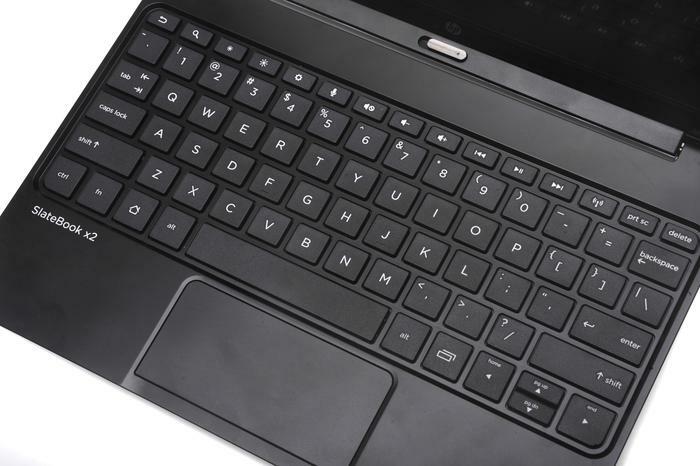 HP has a long history in Windows based notebook computers, so it's no surprise that the SlateBook x2 simply looks and feels like a Windows netbook when the keyboard is attached. The design is best described as unassuming, and perhaps even a little boring. The tablet itself has a thick, gloss black bezel surrounding the screen, while the back (or the lid when the keyboard dock is attached) is finished in a smooth, matte surface that's available in black and white variants. Although it can get a little dirty with regular use, we much prefer the look of the white model we reviewed. Weighing 607g without the keyboard and 1.27kg with the dock attached, the HP SlateBook x2 isn't the lightest device around. While we can appreciate the benefits the keyboard dock brings, this combination is significantly heavier than most other Android tablets on the market. Even when using the tablet without the dock, the SlateBook is heavier than many comparable devices. If you're planning to lug this thing around everyday, you'll need to keep the hefty weight in mind. The most notable feature of the SlateBook x2 is HP's decision to place the power and volume buttons on the back (or the lid when the tablet is docked). While this isn't a bad idea in theory, the buttons sit flush with the surface, making them hard to feel. Even after a full week of use, we found ourselves constantly sliding our fingers around trying to find the buttons. On a positive note, the buttons are well placed when you're using the tablet without the keyboard dock, especially in landscape mode. 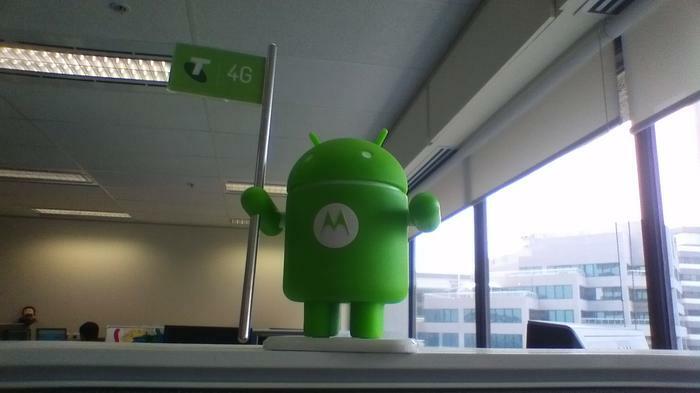 We also like how the back of the tablet curves in towards the edges. This makes it relatively comfortable to hold and use, and the evenly distributed weight is also a nice touch. The buttons on the back of the tablet are well positioned, but sit flush with the surface. All other ports are located on the bottom of the SlateBook x2. There's a microSD card slot to expand the 16GB or 64GB of internal memory (depending on the model you choose), along with a standard 3.5mm headphone jack and HP's proprietary charging and dock connector port. Two front-facing speakers are located below the screen, on either side of the tablet. They produce decent sound at a reasonable volume, though there's noticeable distortion and a distinct lack of bass. The keyboard dock is the real star of the SlateBook x2 and most certainly how HP has intended the device to be used. It includes a QWERTY keyboard, a trackpad and comes with a built-in battery. There's also a full-sized USB port and a standard headphone jack on the left side, along with a full-sized HDMI port, and a full-sized SD card slot on the right. The keyboard is comfortable to type on and also includes a trackpad. The keyboard is certainly good enough for producing text-heavy documents. While the keyboard is a little cramped, it becomes comfortable to type on once you get used to the layout. The spring-loaded keys have a matte finish and provide good tacility, while typing isn't a very noisy affair. We managed to type this entire review on the SlateBook x2, so it's certainly good enough for producing text-heavy documents. The trackpad is relatively large and also works relatively well, but it annoyingly can't be disabled. We often accidentally bumped it while typing a document, frustratingly moving the keyboard cursor in the process. The keyboard dock connects to the SlateBook x2 via the proprietary dock connector on the bottom of the tablet. While it easily clicks into place, the tablet rocks when you tilt the angle of the display and does feel a little flimsy. The SlateBook x2 is slightly top heavy, so you'll need to take extra care when using it on your lap to ensure it doesn't topple over. Annoyingly, it's almost impossible to open the SlateBook x2 with one hand. When closed, there's no space for your finger to effectively wedge between the tablet and the dock to seperate the two. Given the device has been designed to be used like a traditional laptop, this is a real downside. Lugging around a power brick simply doesn't make any sense. Perhaps the strangest decision of all is HP's decision to bundle a traditional laptop power brick with the SlateBook x2. On a device that's been designed for portability, lugging around a power brick in order to have to charge the tablet simply doesn't make any sense. While ASUS also uses a proprietary charger on its Transformer range of tablets, it doesn't include a power brick, and nor should the SlateBook x2. The SlateBook x2's display is disappointing. The 10.1in, LED-backlit panel has a respectable resolution of 1920x1200, displays crisp text and is responsive to touch, but it's not as bright as many competing panels. The screen is very reflective and colour reproduction lacks the vibrancy we're used to from the latest Android tablets. Further, there's no automatic brightness setting and the display has a yellowish tint, particularly noticeable when reading Web pages on a largely white background. The SlateBook x2 offers fair, but not outstanding performance. 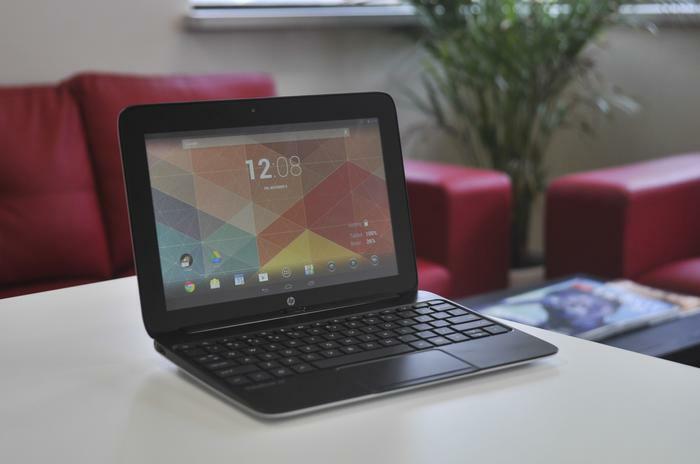 The HP SlateBook x2 runs an almost completely stock version of Android 4.2 Jelly Bean and that's largely good news. The only changes you'll see are a few extra options in the settings menu and a range of extra apps that HP has pre-loaded. Three DTS sound presets (movie, music, voice) and some HDMI out options are the changes HP has made to the settings menu. The sound presets do make a difference, but you'll need to be using headphones to notice any sort of improvement. We found the music setting provided a significant bass boost to audio playback. The SlateBook x2 offers fair, but not outstanding performance. We did experience the odd app crashing, the screen turned off by itself twice during regular use and the screen can often be slow to wake up from sleep. Thankfully, general performance is smooth and fast for most part. The tablet handles graphically intense games, such as Real Racing 3 and FIFA 14, with ease and we had no issues switching between apps using Android's regular multitasking menu. All in all, the 1.8GHz NVIDIA Tegra 4 processor and 2GB of RAM is clearly enough to keep the SlateBook x2 running pretty efficiently, despite the odd software hiccup. The SlateBook x2 runs a largely stock version of Google's Android operating system. It's one of the worst cameras we've ever used. HP pre-loads a number of apps on the SlateBook x2 including the Box cloud storage service, the Kingston Office suite and Splashtop, which allows users to remotely access Windows computers. HP has also included a few of its own apps: a file manager, the ePrint app, and a media player that handles music, photos and videos. It has also slightly re-designed the camera application, but there aren't any real notable new inclusions. It seems to be a general trend that tablet cameras are extremely poor, but the SlateBook x2's rear camera is one of the worst we've ever used. The 2-megapixel camera suffers from excessive image noise, poor colour reproduction and a lack of detail, so HP may as well have left it out altogether. The front-facing 1-megapixel camera works well enough for video calling applications like Hangouts and Skype, provided you're not expecting quality. HP says the SlateBook x2 can run for over 12 hours with the dock connected, but we didn't experience anywhere near that figure during testing. We found the tablet on its own lasted just under six hours, while adding the dock added approximately two hours of further use. While just over eight overs of battery life doesn't sound too bad overall, a number of other tablets on the market achieve more than this figure without the aid of a keyboard dock. Given the device is drawing power from two batteries, the battery life of the SlateBook x2 is extremely disappointing. The HP SlateBook x2 is available now in Australia online through HP's Web site and through selected retailers including JB Hi-Fi and Bing Lee. The 16GB model sells for $649, while the 64GB version retails for $749. In New Zealand, the SlateBook x2 sells through Noel Leeming and JB Hi-Fi at $799 (16GB), or $899 (64GB). It is also available through various smaller computer retailers for as little as $669/$731 respectively.